Private enterprise played an enormous role in forming Chicago’s early urban transportation systems and, thus, the city’s development. In Chicago, these agencies of growth and development were a bewildering number of privately held transit companies. By 1900 there were at least 17 separate street railway companies, four elevated companies, and a number of interurbans, each with their own stations, stops, equipment, and fares. As competing transit companies laid elevated and surface track through existing neighborhoods and into undeveloped areas, the city’s authority to grant franchise permits and pass ordinances achieved only minimal control. In large part, it was the choices made by the transit owners that both centralized and decentralized urban development in the late 19th and early 20th centuries. The Chicago and South Side Rapid Transit Railroad Company was the first to successfully obtain right-of-way and permission to build an elevated passenger railway in Chicago. 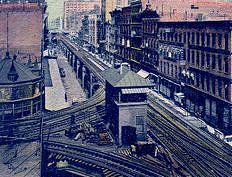 Constructed over alleys through the South side, the Alley “‘L” opened for regular service on June 6, 1892. The Lake Street “L” began servicing the West side on November 6, 1893, followed by the Metropolitan West Side Elevated Railroad Company on May 6, 1895. 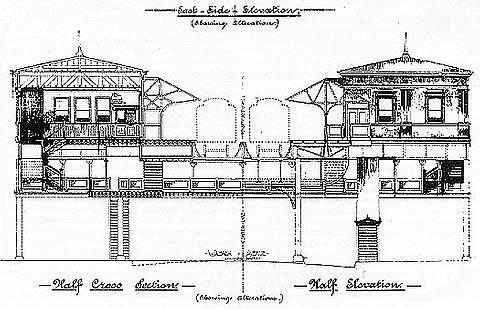 The final “L” line, operated by the Northwestern Elevated Railroad Company, didn't begin passenger service until December 31, 1899. 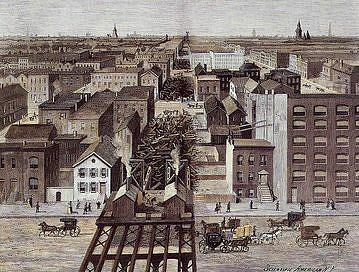 One of the consequences of early transit competition in Chicago was the centralization of commerce, industry, and services in the heart of the city’s central business district, known then and now as the “Loop.” The Loop was initially defined in 1882, by the tracks of a cable streetcar turnaround. Its place, both geographically and historically, was cemented in 1897 by the opening of the elevated Union Loop serving the city’s elevated railway companies. By 1910, the Loop—a half-mile-square section of downtown Chicago—contained nearly 40 percent of the total assessed land value of the 190-square-mile city, and accommodated the arrival of 750,000 people a day on its streetcar and “L” lines. Chicago mass-transit riders relied on private street railways for years before the “L” was built. Franklin Parmalee's horse-drawn omnibus ushered in Chicago’s street railway system in 1853. Parmalee and other investors chartered the Chicago City Railway Company in 1858 providing horse railroad service to the city. Beginning about 1881, Chicago City Railway converted to cable cars. Because of safety concerns, electric trolleys weren’t allowed within city limits until the 1890s. Pedestrians, street cars, horse-drawn carts and carriages all share the road in this early 1900s view of “State Street, that great street.” State Street was, and continues to be, one of the main avenues of traffic and commerce in the center of Chicago’s central business district, the Loop. “You take your life in your hands when you attempt crossing State Street with its endless stream of rattling wagons and clanging trolley cars. New York does not for a moment compare with Chicago in the roar and bustle and bewilderment of its street life.” A tourist in Chicago, turn of the 20th century, quoted in Mayer, Harold M. and Richard C. Wade, Chicago: Growth of a Metropolis, 1969. 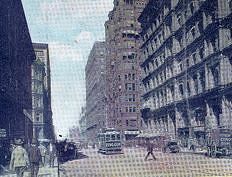 A lone electric streetcar rolls down LaSalle Street in this post card view from the early 1900s; horse-drawn carriages and an automobile are parked on the side of this broad street while pedestrians go about their business. 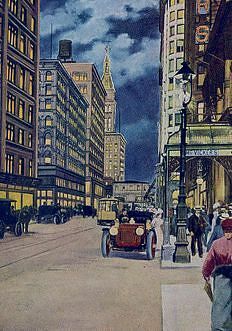 An electric streetcar, and horse-drawn carriages and carts share the road with an early automobile in this view of Madison Street, a major East-West thoroughfare in downtown Chicago. 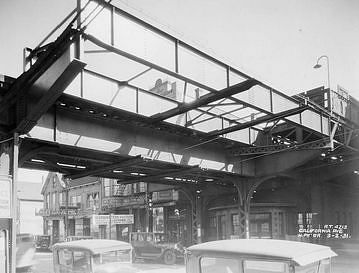 The Madison & Wabash Loop “L” station is suspended above the street in the distance. Under the stewardship of local financier Charles Tyson Yerkes, Chicago’s competing transit companies fought for and obtained the right-of-way to build a loop of train tracks about 25 feet above major streets in Chicago’s downtown central business district. The Union Loop “L” route opened fully in 1897, allowing each of the private transit companies to bring commuters directly into the city center, and to transfer more easily between the different routes. 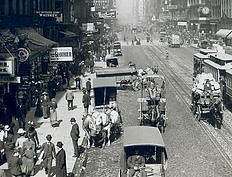 At the turn of the 20th century, Chicago’s Loop was one of the most densely packed and gridlocked commercial areas on earth. This c. 1905 bird’s eye view shows Chicago's “L” structure towering over Wabash Avenue, a major north-south street in the central business district. This view from the early 1900s shows the entrance to the Union Loop at Wabash Avenue and Van Buren Street, on the south end of Chicago’s Loop. A wooden South Side Elevated Railroad train passes Tower 12; a Northwestern Elevated train approaches the junction. Quotes from Mayer, Harold M. and Richard C. Wade, Chicago: Growth of a Metropolis, 1969. Chicago residents increasingly chose to distance themselves from the maelstrom of the Loop. While the wealthiest commuters lived a comfortable carriage (and, later, car) ride away from the heart of downtown, the expanding streetcar and elevated lines offered mobility to many more. Those who could afford to opted for living in lower-density areas. 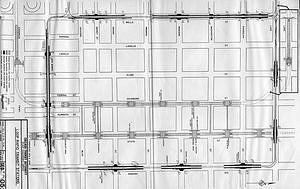 Apartment building, subdivision, and bungalow construction continued to follow the “L” and streetcar in radial lines out of the city. The majority of the people moving out to these new homes continued to rely on mass transit to bring them back downtown to work and shop. View of the Harrison Street “L” station, Westchester, Illinois, September 1926. View of the Canterbury “L” station, Westchester, Illinois, December 1930. By the 1920s, competition, battles over unification and fares, bad management, and the need to supply stockholders with profits were pushing the privately-held transit companies to the brink of receivership. The city tried and failed to get the support necessary to purchase the transit companies and make them public, but did win ordinances and regulations that would force the private companies to improve services. The efforts seemed to be rewarded. Mass-transit ridership in the city (and around the country) reached an all-time high in 1926. Yet automobile purchases were on the rise, as more residents embraced the convenience of using their own car to get around the city. Mass transit ridership was at its highest level in Chicago around the time of this cartoon; so high that the Chicago Rapid Transit Company—a private corporation formed in 1924 by the merger of Chicago’s competing “L” companies—was forced to start running longer trains during rush hour on most of the routes. It would take Chicago another 20 years to be able to purchase and municipalize the elevated and most of the ground transit systems. But by the time this happened, in 1947, the city had changed dramatically; and fewer politicians, businesspeople, or residents looked to transit to steer future residential and commercial growth. 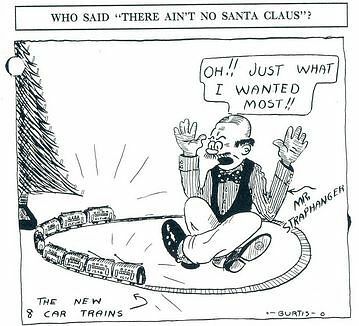 This cartoon, commenting on public reaction to the Chicago Rapid Transit Company's decision to run the 8-car trains, appeared in The High Line, the company’s employee newspaper. During the 1920s, the number of cars in Chicago quadrupled. The Cook County Superintendent of Highways began to warn that Chicago roads were dangerously congested, and that road building was not keeping up with auto registration. 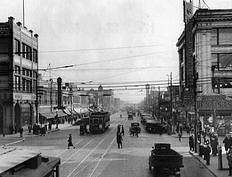 View of California Avenue “L” with automobiles, Chicago, Illinois, March 1931. 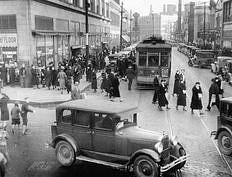 This 1935 photograph shows pedestrians, a 1910 Pullman streetcar, and countless automobiles. Chicago decided almost inadvertently to favor the automobile as early as the 1920s. Although “L” ridership reached its peak in the 1920s, a variety of road projects—including a far-reaching superhighway system—were proposed during this period, as city leaders and planners began to look for ways to adapt the city to the car. As more citizens chose and were able to purchase and use private automobiles to get around, they began to alter the circulation patterns of the city. 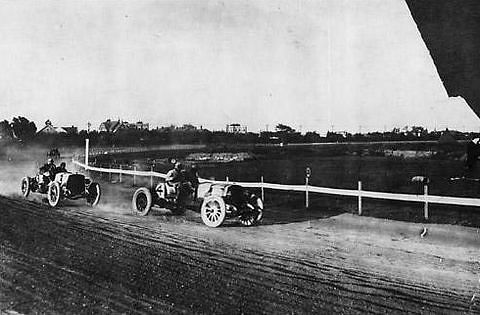 Over the next decade, the Chicago Motor Club, with assistance from the pro-business Chicago Tribune, began to agitate for constructing urban highways. In this 1935 photograph of Chicago’s Ashland Avenue, pedestrians crowd the sidewalks, countless automobiles park on the diagonal along the curb, and a 1906 J.G. Brill streetcar pauses in the middle of the street. 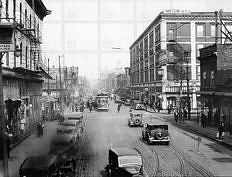 This 1935 photograph of Halsted Street in Chicago shows pedestrians, a 1907-08 J.G. Brill P.A.Y.E. (Pay As You Enter) street car, and many automobiles. Though mass transit struggled to compete with the automobile, it did remain a critical part of Chicago’s urban transportation system. 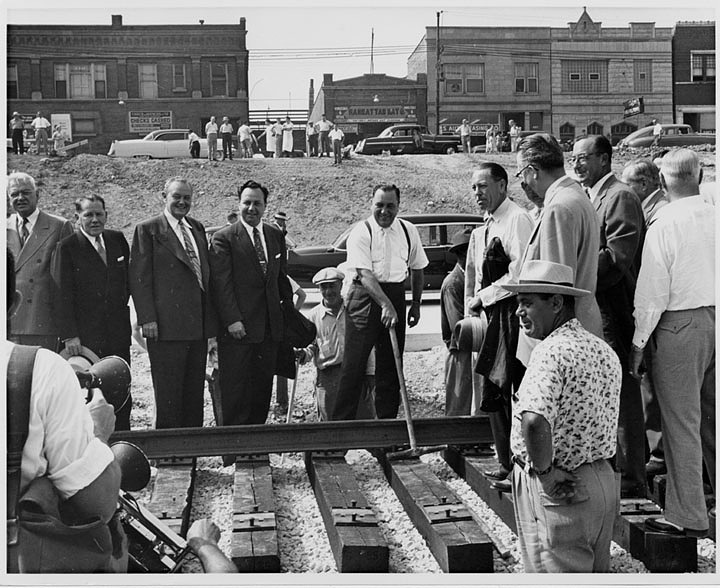 One of the most substantial transportation projects completed in Chicago in the 1940s was the opening of the first subway line. 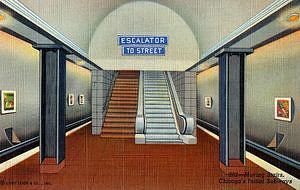 Harold Ickes, at the Federal Emergency Administration of Public Works, pushed through Federal appropriation to build Chicago’s long-planned subway—an important turn of events in U.S. urban transportation history. This was one of the earliest instances in the country of the federal government becoming involved in local urban transportation issues. 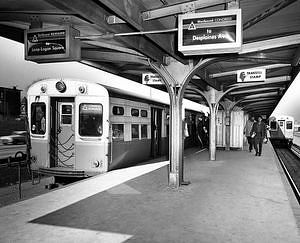 Chicago’s first subway line opened in 1943. Mass transit no longer shaped the city, but it did still play an important role in moving people around the city. Public transportation not only provided mobility for those with limited access to a car, but also offered an attractive alternative to the rapidly increasing traffic congestion that characterized cities in the post-World War II auto age. 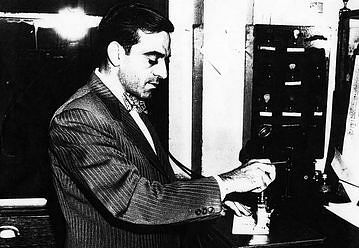 John Caprino, Cook County Clerk, Recording CTA Purchase of Surface and Rail Transit Lines on September 30th, 1947. 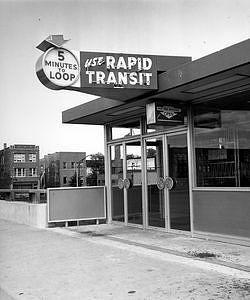 In 1947, the City of Chicago purchased the rapid transit company and most of the surface lines and consolidated them under the newly-formed Chicago Transit Authority. This was the culmination of more than 20 years of “traction wars” and political wrestling in Chicago. The CTA was formed as a quasi-public body—given no power to tax, and no subsidization. When the Chicago Transit Authority was created in 1947, transit ownership shifted from private to public control. But—unlike automobility—transit at that time was required to be financially self-sufficient. All maintenance and upgrades had to be paid for out of the fare box—out of the pockets of transit riders. This resulted in constantly increasing fares and some service cutbacks. 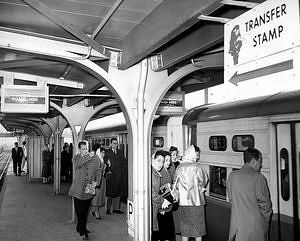 Still, a high rate of Loop commuters—80% by one account—used some form of mass transit in the mid-1950s. The Chicago Transit Authority faced many challenges in its first years. The agency was forced to contend with obsolete rolling stock, aging infrastructure, declining ridership, and escalating costs, combined with rapid changes in the demographics and landscape of the city. From the early 1900s through 1957, the Indiana Avenue “L” station served as a transfer point to the Chicago Stockyards and to the South side Kenwood neighborhood. But by the 1950s, the once busy Stockyards had closed; ridership was down on both the Stockyard and Kenwood routes, and their infrastructure was crumbling. Both branch lines were closed in 1957, though the main line has continued to service Chicago’s South side. This view shows a northbound 6000-series, Englewood-Howard “A” train, and a south-bound Jackson Park “B” train. A few passengers wait on the platform. 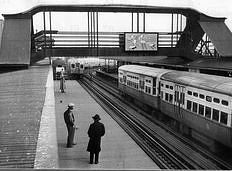 By the 1950s, aging infrastructure consituted a big challenge for the CTA. Many of the rapid transit stations and structures were more than 50 years old by this time. 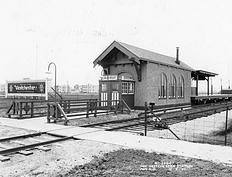 This station house was built in 1896, and torn down sometime soon after this photograph was taken. The inner-Loop station house remains— the last of the original “L” structures over Wabash Avenue. CTA, Your Company. Two pages of a 1955 brochure published by the CTA for its employees. The Chicago Transit Authority struggled financially for decades. In the 1950s, the agency had to budget for replacement of aging trains and buses, and increased operating costs—at the same time that ridership and revenue declined. 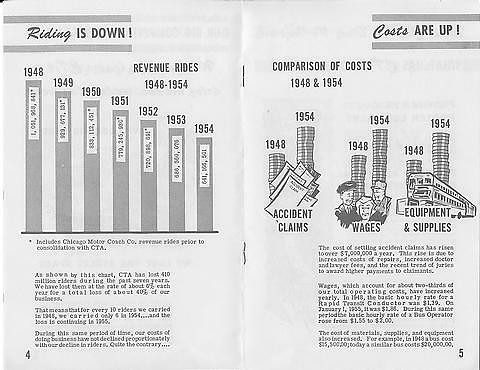 This 1955 CTA publication points out that ridership is down while costs are up—"As shown by this chart, the CTA has lost 410 million riders during the past seven years. We have lost them at the rate of about 6% each year for a total loss of about 40% of our business. That means that for every ten riders we carried in 1948, we carried only 6 in 1954...and the loss is continuing into 1955. During this period of time, our costs of doing business have not declined proportionately with our decline in riders. Quite the contrary.... The cost of settling accident claims has risen to over $7,000,000 a year...Wages, which account for about two-thirds of our total operating costs, have increased yearly...The cost of materials, supplies, and equipment also increased." “Loop Rapid Transit Stations.” Revised drawing, dated 8-15-56, for the Chicago Transit Authority’s Staff Engineer’s Office. This 1956 map shows the route of Chicago’s Loop “L”; the placement of Loop “L” and subway stations; the route of the subway lines under the Loop; entrances, exits and transfer bridges; and a few of the major buildings served by the CTA. For city residents and suburbanites who continued to rely on transit for their daily commute into the Loop, the Chicago Transit Authority sought innovative ways to make itself a viable alternative to driving. In the 1950s, for the first time in decades, money was spent on building new rail lines and on purchasing new surface and rail vehicles—sometimes at the cost of rising fares and service cuts. In the 1950s, the Chicago Transit Authority sought to modernize its fleet, infrastructure, and operations as it worked to position itself as a leader in planning for the future of the city. 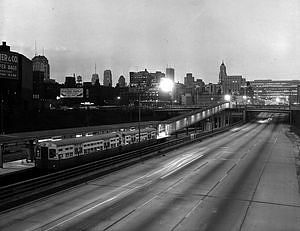 One of the CTA’s major innovations in the 1950s was the construction and opening of the new Congress Expressway rapid transit line. Forward-thinking transportation planners in Chicago had envisioned early on the possibility of including a median strip rapid transit line in the construction of the city’s expressways. Chicago pioneered this method of integrated urban transportation. 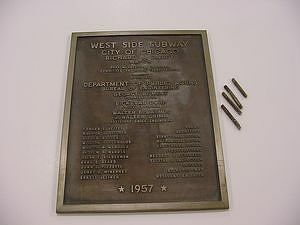 Plaque installed in a CTA Congress Line “L” station to commemorate the construction of this innovative median-strip rapid transit line. 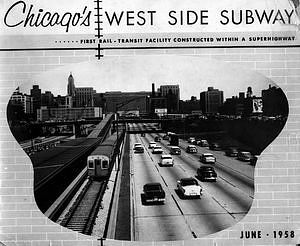 The new Congress Expressway (West Side Subway) rapid transit line allowed the CTA to modernize infrastructure and to speed service through the city’s West side; to make use of the other-wise underutilized right-of-way in the new highway; and to develop an integrated transportation network of rapid transit, buses, and roadways. The experiment was successful in many ways, and has been emulated throughout the United States in the years since. Yet, critics point out that the line merely replaced the nearby Garfield Park line while it offered fewer stops through West side neighborhoods. In addition, the station and platforms are isolated from surrounding neighborhoods in the middle of a busy expressway. 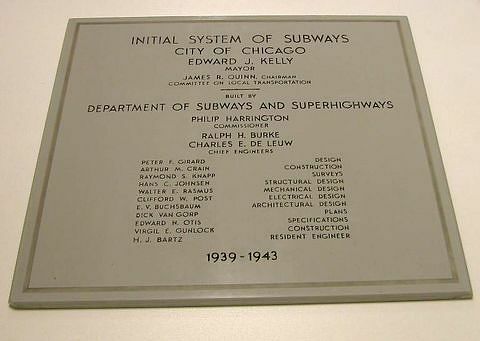 Here you see the cover and a selection of views from Chicago’s West Side Subway: First Rail-Transit Facility Constructed Within A Superhighway, printed by the CTA in June, 1958. This book of photographs was printed by the CTA in 1958 to illustrate the new stations along the Congress Expressway rapid transit line. There was little money left in the CTA’s budget for modernizing all of the aging facilites throughout the “L” system. 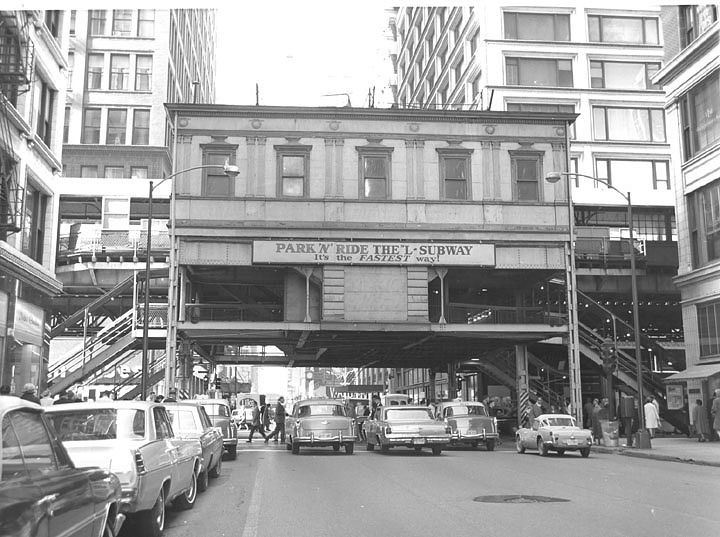 In the mid-1950s, the CTA partnered with a major downtown department store, Marshall Field & Company, to tear down an original 1896 Loop “L” station house at Randolph & Wabash, and to replace it with a sleek modern version. The CTA and Field’s, alike, surely hoped that this updated station and direct entrance to the store would attract customers who might otherwise be drawn to new stores in the suburbs. 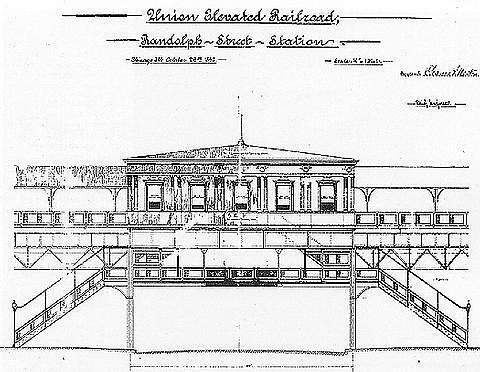 Elevation of the original Randolph and Wabash station, prepared October 26, 1896 for the Union Elevated Loop Railroad. Inner Loop Station to Undergo Remodeling, 1954 From CTA Transit News, August 1954. 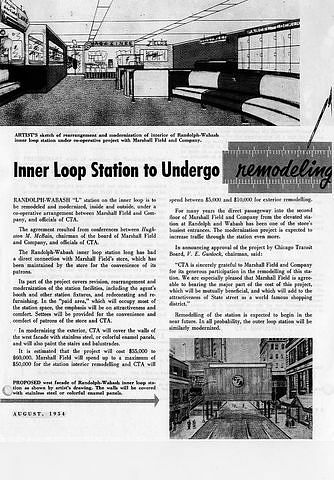 This article shows a conceptualization of the planned interior and exterior renovations at CTA’s Randloph & Wabash “L” station in the mid-1950s. 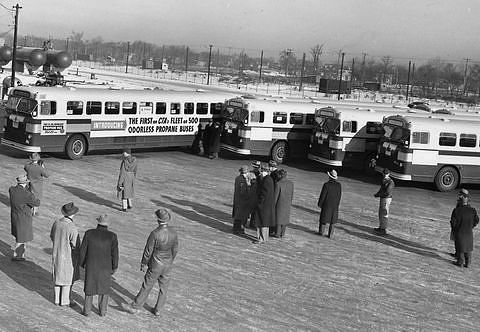 The CTA also pioneered the use of Liquified Petroleum Gas (LPG), or Propane, fuel as it modernized its bus fleet after World War II. In the 1950s and 60s, the Chicago Transit Authority owned and operated the largest fleet of propane gas buses in the world. Propane was less expensive than diesel fuel at the time, allowing the CTA to allocate more resources to upgrading service and operations. The First of CTA’s Fleet of 500 Odorless Propane Buses. This photograph, taken the winter of 1950-1951, is one of a series in CTA collections documenting the delivery of the CTA’s new Liquified Petroleum Gas (LPG), or Propane, fueled buses. 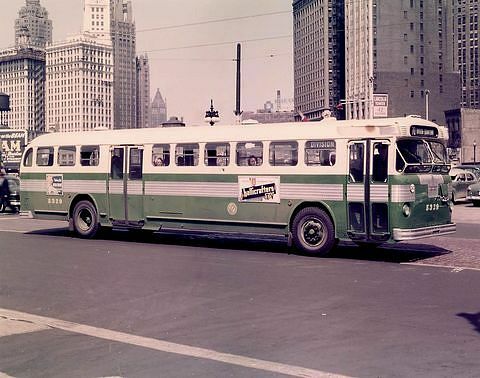 Twin Coach bus in Chicago, 1950s. This green-and-white CTA bus is one of a fleet of about 1400 Twin Coach propane buses, manufactured by the Fageol, later Flxible, bus company. These classic, “Old Look” buses are easily recognized by their high, 6-paned windshields. In the 1950s, the Chicago Transit Authority strove to build ridership in many ways. 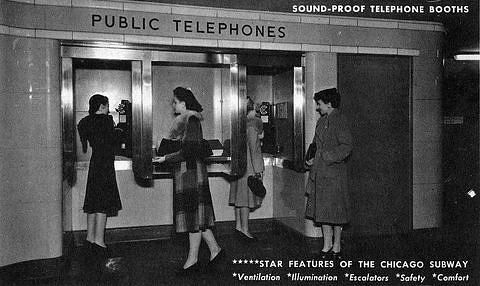 Publications like these reminded residents and visitors that most of the city was accessible by public transportation, and touted modernization efforts like noise reduction to make the system more attractive. Even with all of these efforts, ridership didn't rise again until the 1990s. But Chicago's transit system survived the challenges of adapting to the changing city through innovation, and making tough choices about fares and service cuts. 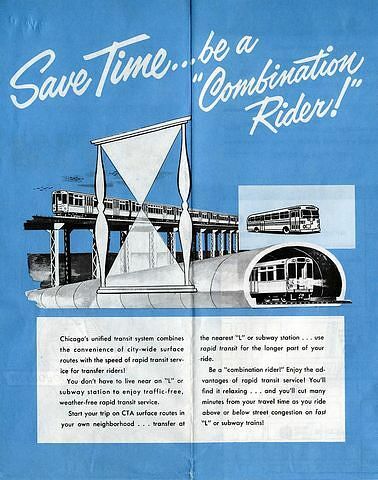 This 1959 brochure includes information on CTA surface (bus) and rapid transit routes, as well as places of interest around the city and how to reach them by CTA. CTA Modernization brings noise reduction…aids paving and one-way street program, From a Chicago Transit Map issued by the Chicago Transit Authority in 1959.